This was one of my first posts on gardening and after looking at the photos I knew I had to redo them. Plus it was great timing for spring seedlings. You don’t have to spend a lot of money on fancy greenhouse kits at the stores. Simply purchase the basics and start your garden in recycled materials you are already using. Best part, you can reuse them again next year, or recycle them after the seedlings are planted into the ground. 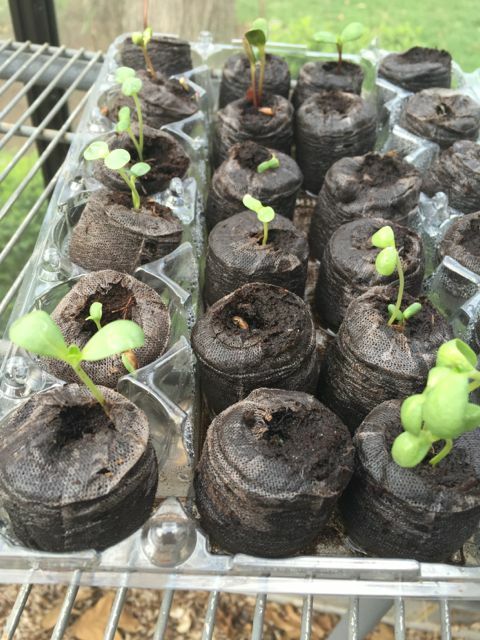 Any plastic container s can serve as Mini Greenhouses. 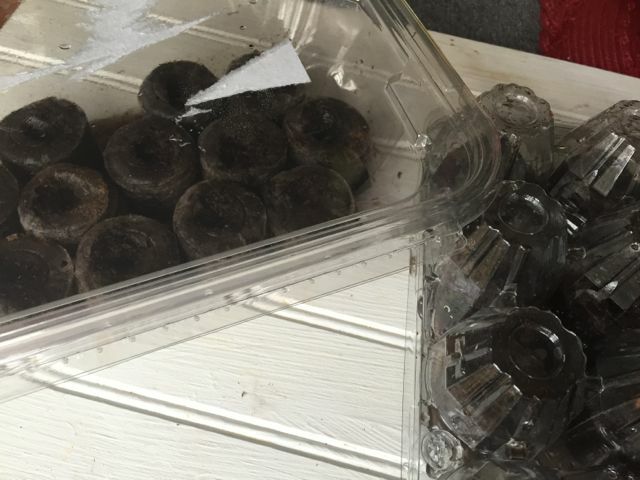 Plant some seeds either directly into seedstarter mix you placed into container or use filled peat pods or previously used plant containers you got at the nursery; and place those into your container. 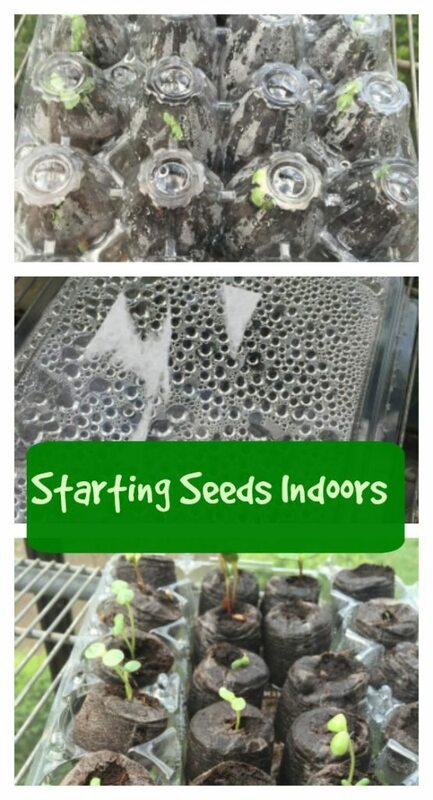 (if using seedstarter mix make sure it is damp b/f adding seeds) Water well and place near a sunny window. I love the little peat discs you can get at Walmart. I have tried home improvement stores but no luck. 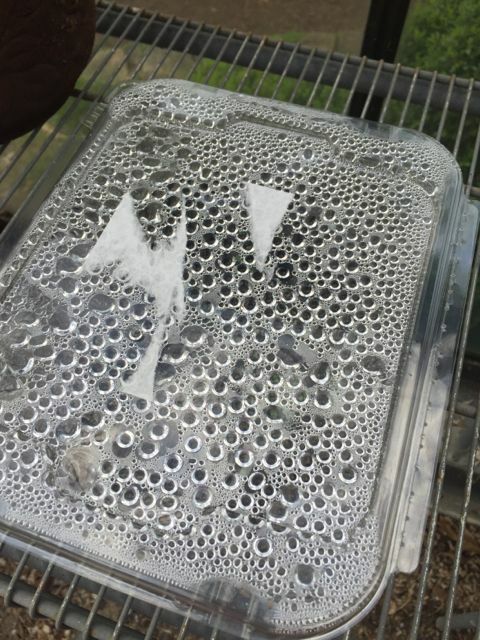 Simply clean out your clear plastic containers, such as egg cartons or lettuce containers and place the discs in there with some water. Watch them expand, a great project for kids to be part of too. Add your seeds and shut the containers. You just need to check the dampness every few days but the seeds will emerge more quickly. Make sure you have something to catch any water underneath. After only about a week we started getting these seedlings. Ever get excited on a warm spring day and put out a plant in your garden and the next week they are calling for low temps. Do you have an animal like a bunny or deer that might like the taste of a new seedling. Or are you just anxious to start seeds. This year I discovered a few ways to use common household things to jump start and protect my garden at the same time. 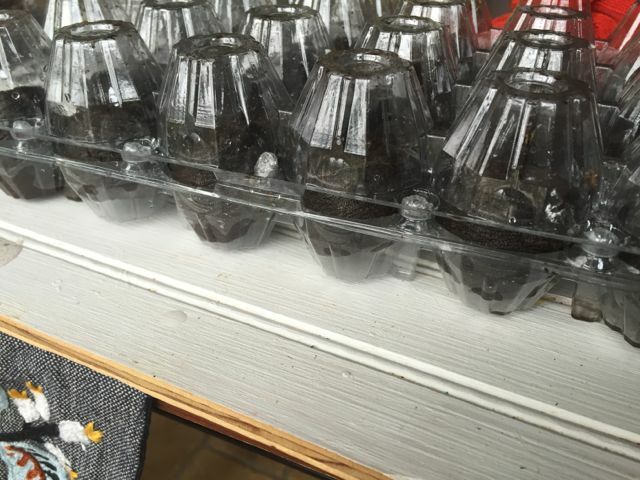 If you cut the bottom off and place over your seedlings or plants you have an instant “hot house”. While not the most beautiful in your landscape, they do the trick without paying a thing. Make sure to they are secure in the dirt surrounding the seeds, or plant. On really warm days you just keep the cap off the container and during cold nights put the cap back on. If you are starting seeds you can keep the container closed and the humidity in the jug will act like a green house. 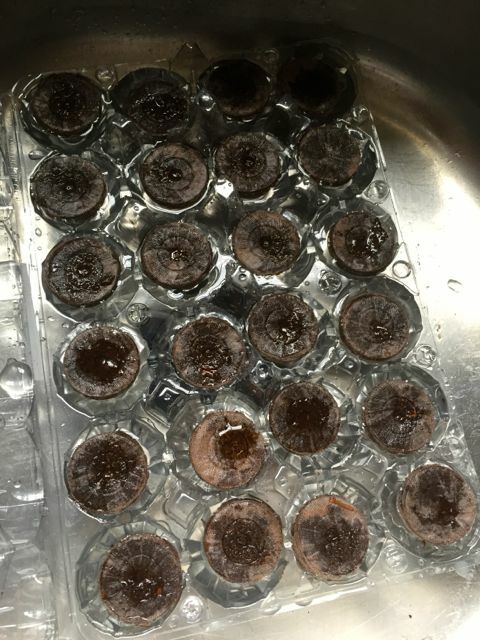 Just be sure to water the seeds lightly to keep the contents moist but should do the trick if they were wet when you began. When the season warms you can just put them in your recycling bin or use as a watering can! Just remember late next winter to start putting them to the side. What are some eco-friendly gardening tips that you can share?